The S/5000e represents a return to one of Threshold’s most well-regarded traditional values: prodigious power at an affordable price. The S/5000e is the heir to Threshold’s legacy of high-current designs that effortlessly command and control demanding loudspeaker loads, delivering the power needed for full revelation of dynamic contrasts and bass extension. But power is only part of the S/5000e story. The amplifier employs minimal feedback, attesting to its inherent stability and excellent open-loop performance, and is direct coupled input to output, with no capacitors in the signal path. Like all Threshold amplifiers, it utilizes close-tolerance metal film resistors, and matched JFETs. The result is superb open and airy resolution of low-level detail — the subtle shadings that differentiate musical performances. 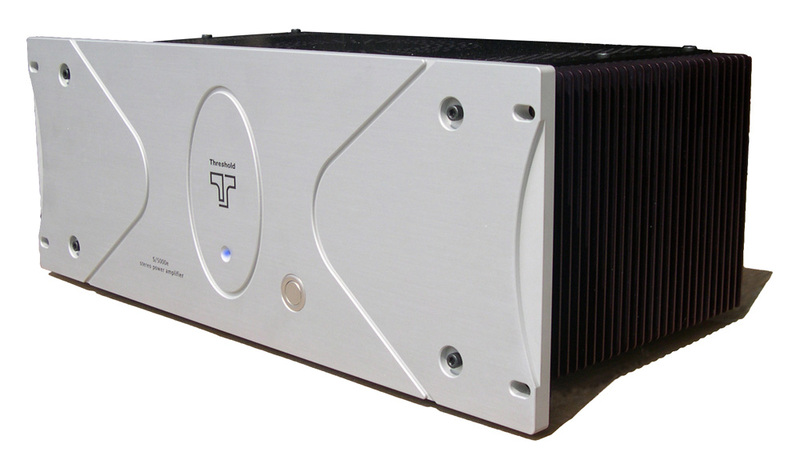 The ability of the S/5000e to reproduce transient attack, and to explicate complex musical passages, confirms its heritage — flowing not only from the famous Threshold designs of the past, but from today’s remarkable flagship power amplifier, the STASIS 8.0. The highly affordable S/5000e brings Threshold’s acclaimed designs within easy reach — it’s state-of-the-art that takes into account the state of your budget.